A top-notch sanctuary in a low-key and often-overlooked corner of the Caribbean. Cool, pigment-infused cement walls in warm colors, soaps hand-made in the Italian Alps, a restaurant offering temptations like Bresaola Condita and Penne Amatriciana . . . could we be in Italy? But wait — then there are the Balinese four-poster beds and bamboo-framed window walls in the luxuriously simple guest cottages, and the thatched roofs of the clubhouse and restaurant. No, not Asia either. 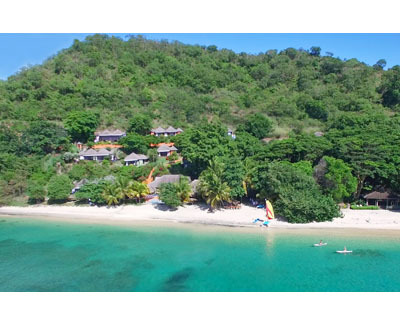 This refined-yet-relaxed concoction of a resort actually overlooks a sparkling beach on Grenada, the Isle of Spice. It's hard to imagine a more perfect fusion of East, West, and Caribbean. The Italian owners' influence is evident in such touches as sophisticated and upscale in-room amenities, art-quality light fixtures, and the eclectic wine list (all Italian vintages, many from obscure smaller wineries) supporting the Italian chef's creative menu. Low Indonesian daybeds and sofas contribute a clean-lined Asian flavor and suit the open-air Sunset Bar and guest room balconies perfectly. The whole place has an easygoing Caribbean lilt, from the plunge pool that completes each cottage to the vistas of lush foliage and turquoise water at every turn. And whoever thought up the partly open bathrooms is a genius, no matter where they're from; you feel as if you're bathing au naturel, but with complete privacy. On Wednesday evenings, Laluna hosts a movie night, set in either the open air yoga pavilion on the beach. And every Thursday afternoon, guests can enjoy a relaxing sunset sail and snorkeling at the Underwater Sculpture Park aboard Laluna's 44-foot luxury catamaran Uendalina, including round-trip private transfer to/from Port Louis Marina. Grenada itself is still largely au naturel as well, easy to explore by mountain bike or moped, sailboat or scuba excursion. Be sure to check out the aromatic spice markets (just follow your nose) — then hurry back to see which flavors the chef is using in the evening's menu.